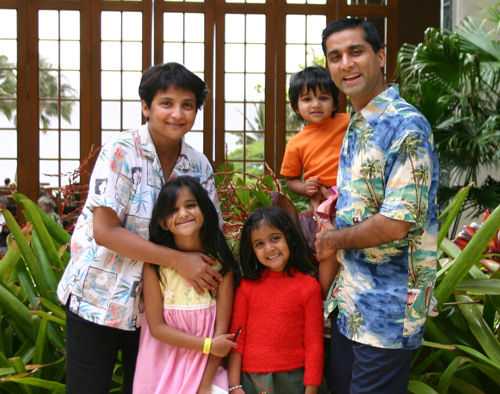 Sugeet and Kaajal met in India while working at a software company. They came to the U.S. from India with a dream to have a better future. Sugeet has an electrical engineering degree, while Kaajal has her MBA. Working hard through their corporate jobs as software consultants, they were looking forward to attaining a strong financial base and a great lifestyle. However, they soon realized that they would have to look at alternate ways of creating income in order to live the lifestyle they wanted. Once they got married the Ajmanis decided to focus their efforts towards starting their own business. Since launching their business, their lives have significantly changed. They are totally financially free, and they have the flexibility in their schedule to be able to spend quality time with their daughters Pallavi, Saloni and Mahika, which is one of the most important things for both of them. The Ajmanis support several charities and believe that it’s important to live a life of significance along with success. In particular, they support Easter Seals in their local area of northern New Jersey, because of the organization’s focus on the needs of children and returning veterans. Even with their current level of success, the Ajmanis believe that the best is yet to come. They enjoy inspiring others to develop an inner sense of security, helping them find out who they are and what they are capable of. They continue building their business with tremendous enthusiasm and passion, having a very positive impact on people around the world.